Can you believe that February is almost over??? 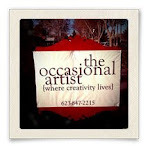 That means it time to show you the new classes that I will be teaching in March at The Occasional Artist. Both samples will be in the store this week if you want to see them up close. But you can sign up by just calling if that is easier for you. 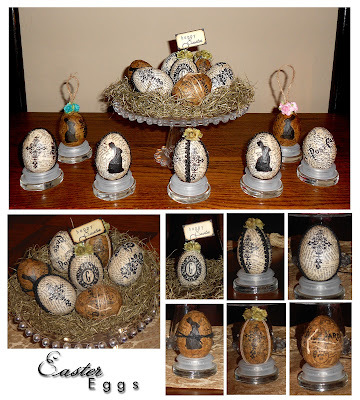 You will get everything you need to make a dozen of these beautiful eggs, although we will not have time to make all 12 in class. Class is from noon until 3pm but I have the studio until 4:30 if any of you want to stay a little later to work on your eggs. Wouldn't these make beautiful place card holders for Easter Dinner or even buffet labels! 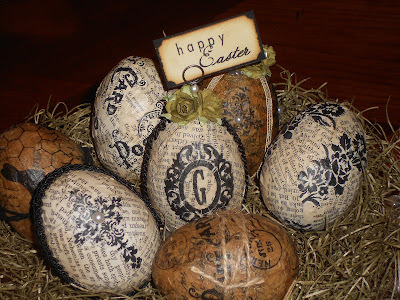 You will also have the option to make yours hang for your Easter Egg Tree if you want. 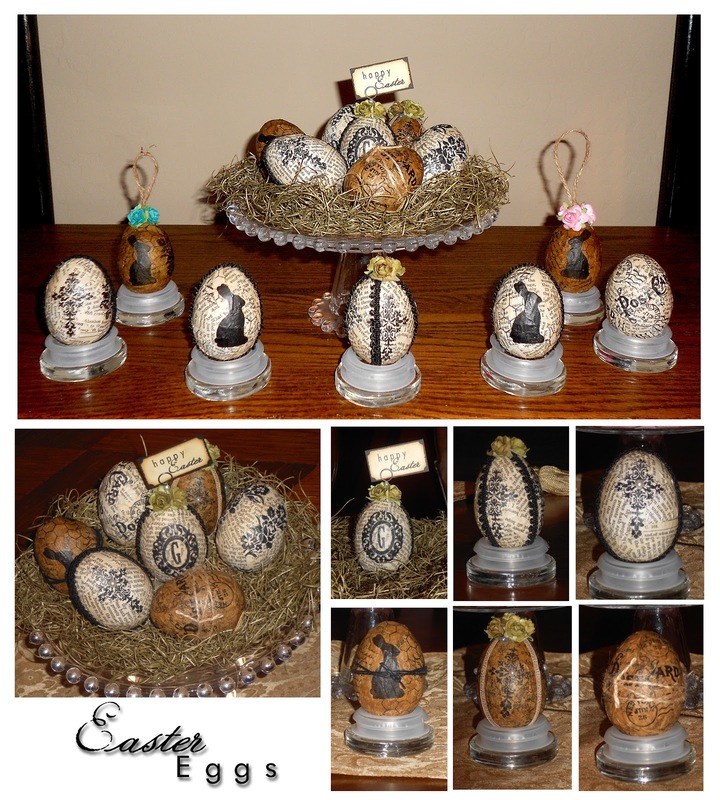 If you have any good Easter stamps you want to use bring those with you too! I really love this project and hope you will be joining us for this class! I originally made one of these for myself, but it got so many comments I decided to teach it as a class. This is how I keep track of the things I want to pray about and the people that I have promised to pray for. With the bronze clip, it makes it easy to just clip up a piece of note paper with my list. As I walk past the Prayer Block during the day I am reminded of those prayers that need to be said. 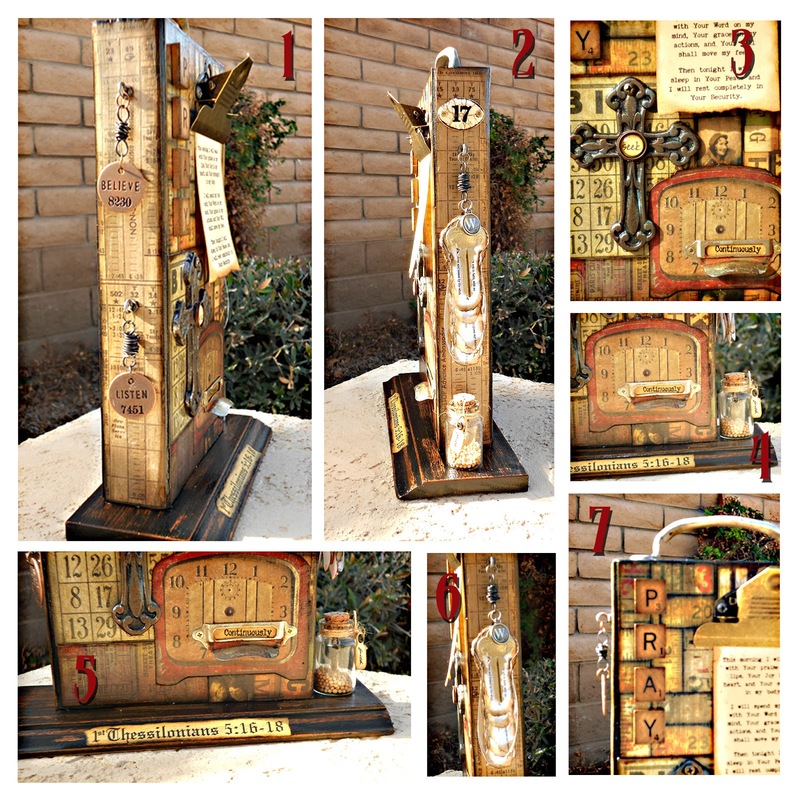 This class is going to give you plenty of opportunities to be creative. You will have lots of choices on papers and embellishments so that this will truly be your own creation. There is a lot of FUN stuff on this project - Let's take a look. . .
#1 - Inspirational metal tags from Tim Holtz and really cool wire pieces made by my friend Deborah and me. 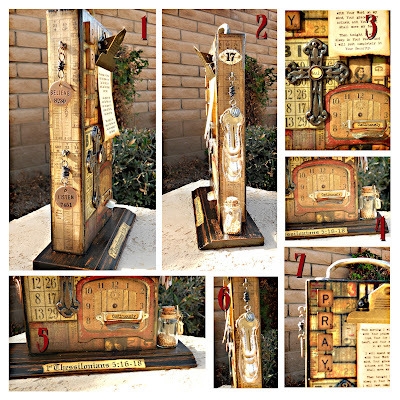 #2 - A Tim Holtz enamel plaque that you will age and crackle. #3 - A metal cross that you will again alter and make your own as well as a bezel with the word "seek" inside. #4 - A little bottle of mustard seeds with a tiny bronze heart locket hanging from the bottle's cork. #5 - 1Thessalonians 5:16-17 is my inspiration verse for this piece. #6 - This is a vintage door key hanging from another of those wire pieces. 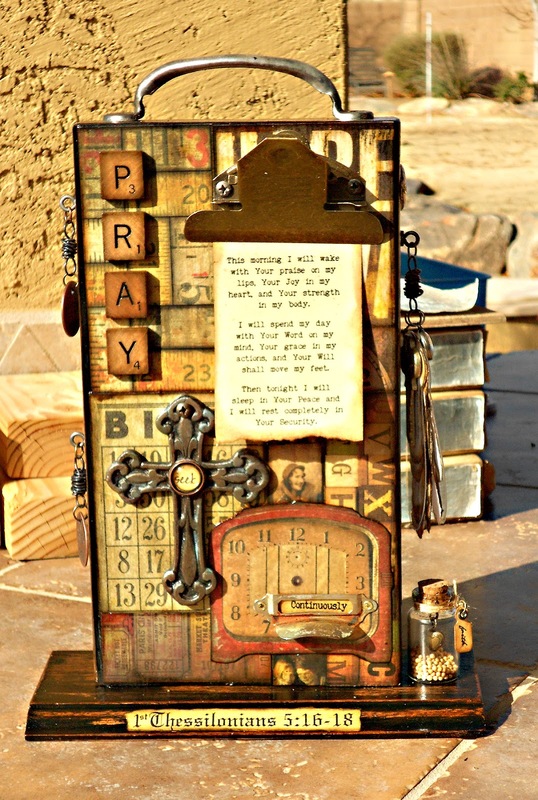 Behind the key is a group of scriptures about prayer. You will get to metal stamp the key. #7 - Actual vintage Scrabble letters! This is an all day class and you will stay busy all day long! Well that's it for classes right now - although I have something really cool in the works for April 27th! The sample is almost finished - stay tuned for pictures! Have a GREAT weekend - I will be hanging out with family all day tomorrow! Rain, Rain, Go Away. . . I really HATE the rain!!!! I don't like to be cold or wet and that is what you get when you go outside today! 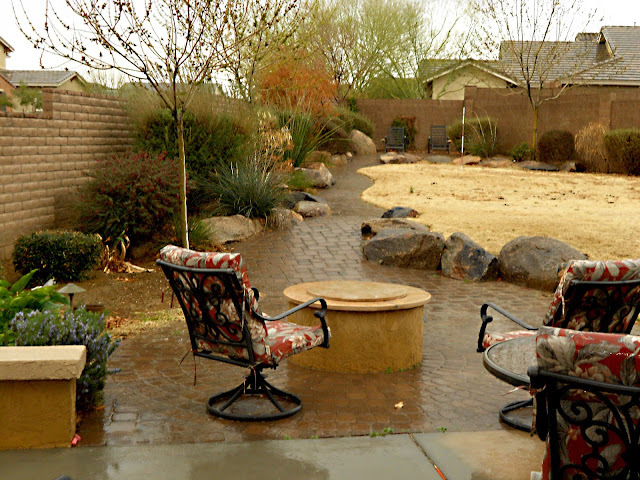 I am soooo unproductive when it rains, I don't know how people live in climates where it rains a lot. So how about you - do you enjoy the rain like my two daughters? Loathe the rain like me? Keep warm & dry until we meet again. . .
Quick update - beore I could finish this post it started hailing - then my husband called me to tell me it is snowing at his office 1.5 miles away!!!! Book Party Marta Style. . . I went a little crazy today! Those of you that really enjoy creating stuff and teach classes on said "stuff" will totally get me today. Those of you that don't, probably wont get me at all and just think I am nuts. But I am willing to risk it and share my joy with you all. 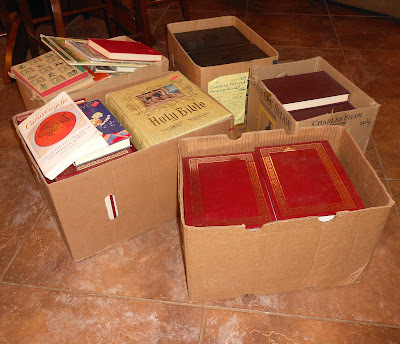 This weekend was the Visiting Nurses Book sale at the Veteran's Coliseum (for those of you not familiar with this, it is a once a year HUGE used book sale. They earn TONS of money for charity with this sale each year and it is all run by volunteers). My Mom works the sale each year and always has the family make a book list of books we want and she tries to get them for us. She gets to buy her books at a pre-sale for the volunteers after they sort and organize all of the books. This year I asked for Little Golden Books and Lizzy and Darwin put in their orders for more highbrow classics. 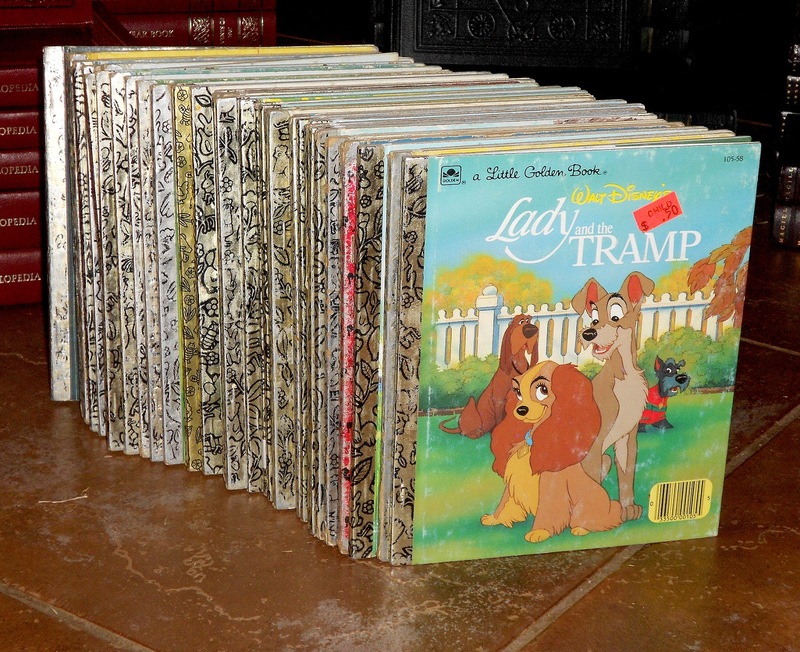 Mom was able to get most of the books we requested on Wednesday - I got 15 Little Golden Books and so I was thrilled! (in act I even have a sample almost completed for my April 27th class - stay tuned for the pictures later this week) Then I remembered that Kathie was also looking for Little Golden Books so I asked Mom if she could get some for Kathie on Saturday when she was actually working the sale. Being the kind woman she is she agreed. This morning as I was unloading Kathie's books I started thinking I would like to go check out the sale so I called my book-worm daughter, Lizzy to see if she wanted to go again (she was there yesterday while I was teaching). 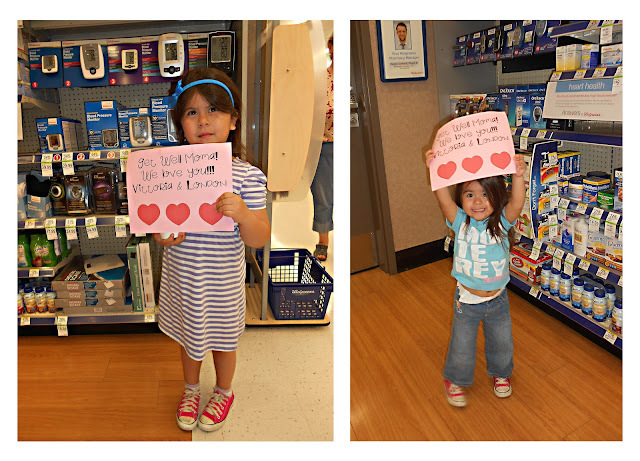 Of course she was up for another trip - after all, today all of the books were HALF OFF!!! With only 2 hours til they closed the doors we raced downtown to get some treasures. I only planned to spend a few dollars - I just wanted a few books or a personal project I wanted to make. Most of the books here are only $1 - $5 so at half price I figured I would be good at spending under $20. LOOK AT WHAT I CAME HOME WITH!!!!! That's right, those are five BIG boxes of books sitting in my kitchen!I told you I went a little CRAZY! So let me show you what all I got today. . . This is all of my books out of the boxes - aren't they pretty! There are 91 books sitting there that I have to find a place to store tomorrow! The funny thing is I didn't buy one of these books to read. I started off in the children's book section looking for just the right size and shape for the project I had in mind. I didn't really find what I was looking for, but I found a few that I liked for other reasons. Then I headed over to classics and found a couple I liked, but still not exactly what I was looking for. So off to another section and there I found what I was looking for (those are the square books). Lizzy was still looking so I wandered over to the religion section and found some cool stuff there that I liked. Mind you I was not prepared to buy "a lot" of books so I am just carrying them in my arms and they are getting heavy and awkward. I set them on the floor while I was looking at the bibles, and added a couple more books to my stack. Here comes the fun part, squatting down to pick them all up and then standing back up with about 20 books in my arms. Let's just say it wasn't pretty! My books went EVERYWHERE!!! But two nice young men helped me gather them all back up. About that time a volunteer came along and gave me a cart to put them all in. This was an epic mistake! Now my arms were free to continue shopping!!! I met back up with Lizzy and we decided to go check out the rare and unusual section. There was nothing there for us so we decided to get in line to check out. But WAIT! On our way to check out (with only 20 minutes left til they closed the door) Lizzy spots the "Collections" section. She wants to take a look and I go with here. That is where everything got really BAD (or GOOD, depending how you look at it). Since they were closing up, they had put the "Collections" section on sale for 75% off! Needless to say my cart would not hold all of my new "hardcover friends" so a volunteer (nice guy named Bill - you know who you are if you are reading this) came along with a dolly. He even helped us out to our car with all of our treasures. So here is my first love that I found in the "Collections" section. 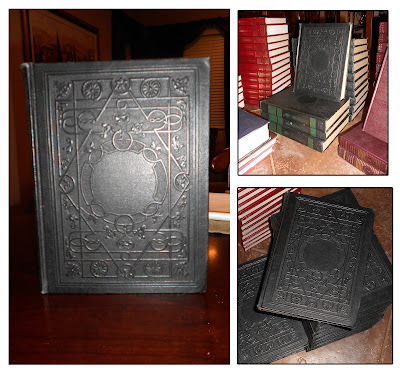 It is a 14 volume set of BEAUTIFULLY covered, 1949 Compton's Pictured Encyclopedias! Can you just believe how gorgeous the embossing detail is on those covers? 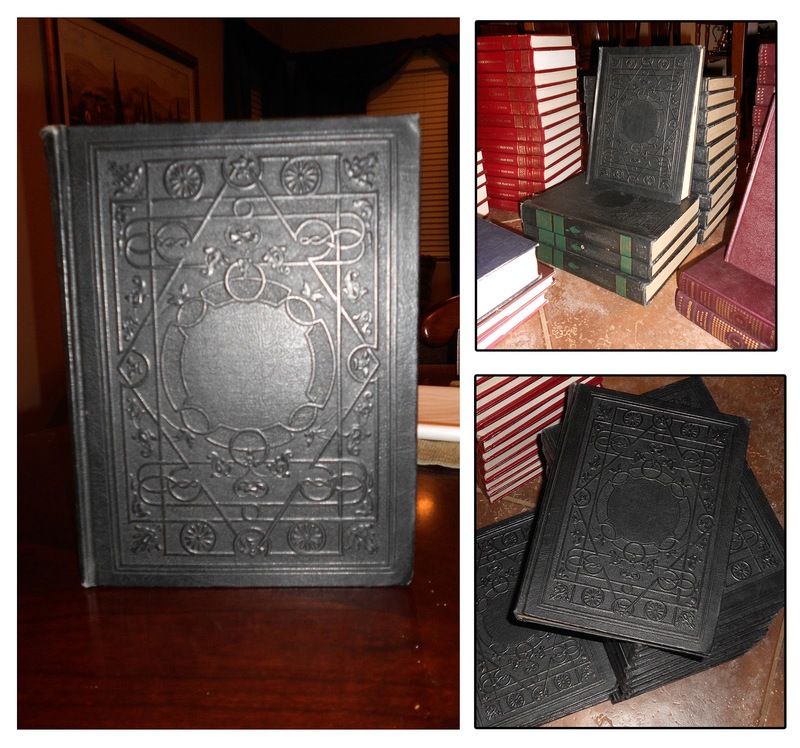 They are just a stunning matte black bonded leather with green text on the spine. And the images inside are to die for! Would you like to guess what I paid for this amazing set??? TEN DOLLARS!!!!!! That's less than .75 cents a book! I know exactly what I am doing with these - be on the look out. Next I found this set - it is a 33 volume set of The 1987 World Book Encyclopedias with the bonus annual updates until 1993. 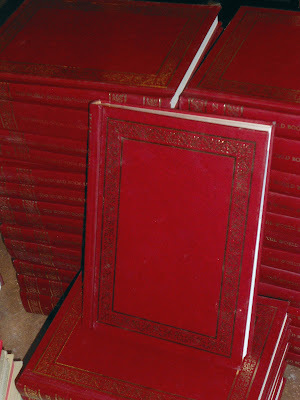 I loved the simple burgundy covers with the gold foil embossed frames on them. 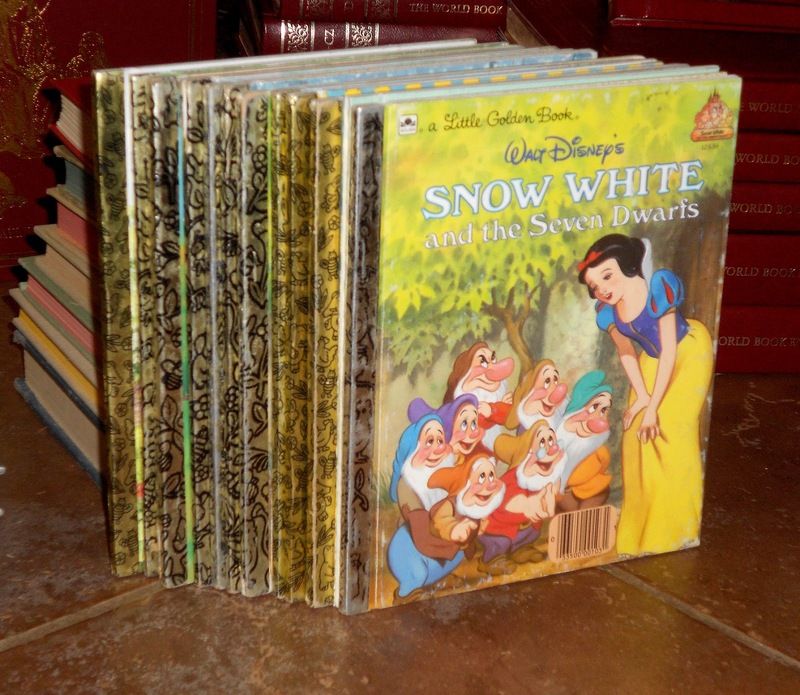 How much for 33 books in PERFECT condition you ask??? Just TEN dollars again! Can we say .30cents a book! I didn't take a separate photo of my last bargain in the "Collections" section so you will have to look up at the main photo - they are the ones titled as "Masterplots". It is a 15 volume set of 1949 Masterplots by Magill. They are digests of the worlds finest literature. They have super simple brown covers with gold embossed spines. They are going to be perfect for journals! This set was also a bargain at FIVE dollars for the whole set! I actually had not planned on buying this set but the volunteers and Lizzy all knew I needed it and brought it over to me when I was trying to leave. They had asked me what I was using the books for. They asked if I was a school teacher. I hesitated when I told them what I was doing, some people don't take kindly to altering books. But they were actually excited when I told them what my plans were for them and that they would be used in a class. Lizzy even got her phone out and showed them some pictures of things I have done. Before I knew it cards had been passed out so they could read my blog and The Occassional Artist had been plugged. 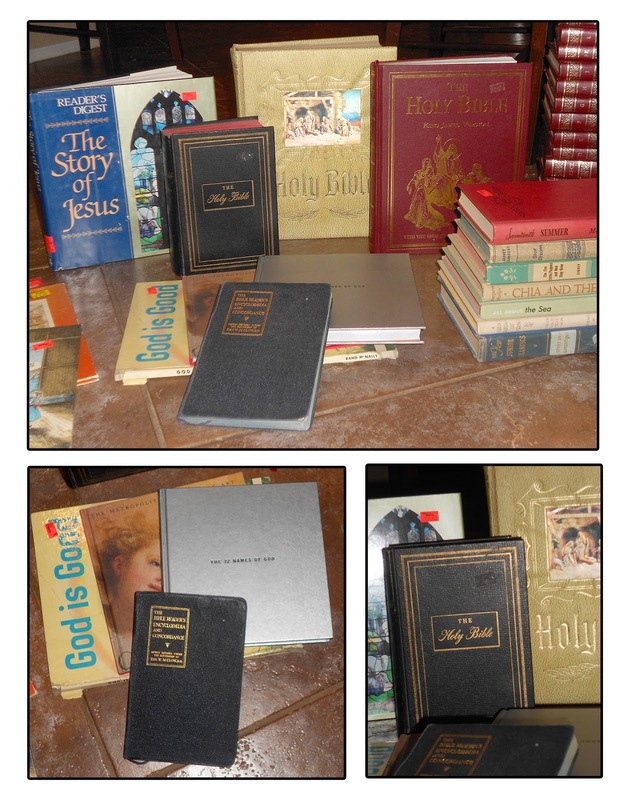 These are my Bibles and religious books - the silver one there on the bottom left was my most expensive single book of the day - $2. 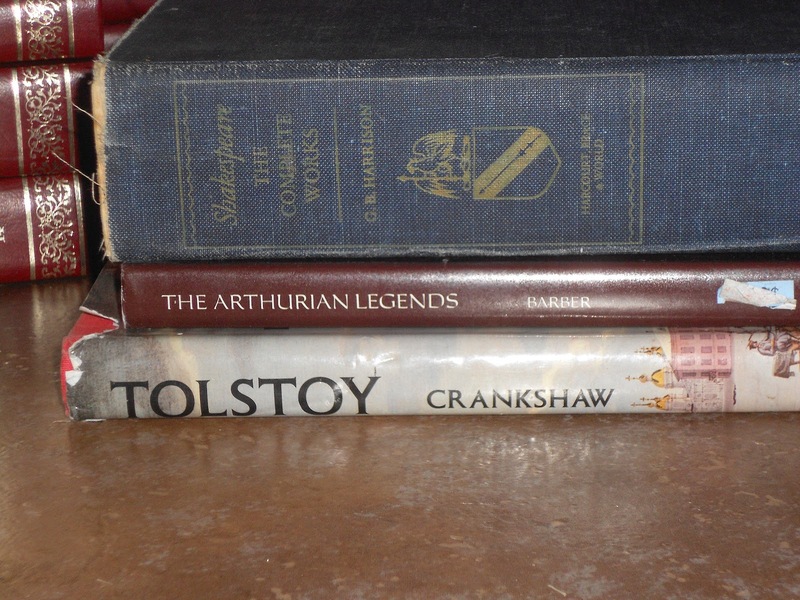 Some kinda "classic"books - complete works of Shakespeare (75cents), a beautifully illustrated book about King Arthur and of Tolstoy. Great images in these last two books. It's hard to see in this photo but these books are really old and have beautifully aged (not torn) cloth covered covers. Can we say .25 - .50cents each! And this is the weekend's BIG HAUL!!!! And in case you are wondering about Lizzy - she also went home with almost 2 full boxes of books today (plus the ones from yesterday and the ones Mom bought her on Wednesday!). All together her books and mine only came to $73 - what an AMAZING DEAL! 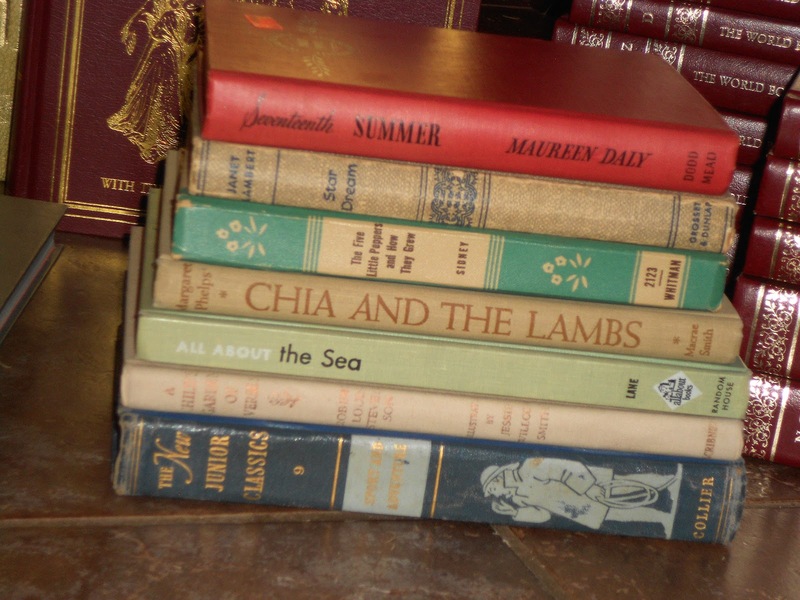 If you like books to read or to alter, or even for decorating with, you need to try to get to next years VNSA Booksale. It is always in February, Sat & Sun only with Sunday being the half price day. Gotta warn you all that there is going to be a lot of altered book art coming out of my studio now! There is already one class in the works for April. So if this is something you like to do watch the classes tab for samples and dates. On a little sadder note I would like to say Farewell to a beloved family friend today. This is my Mom's dearest friend Jo. Jo has been a member of the VNSA for eons and is how my Mom got involved. Jo was not able to participate in the sale this year because of her health. While Lizzy and I were eating dinner after the book sale we got a text saying that Jo had passed away today. Jo was a beautiful woman, kind and gentle and the only one in my life that ever called me "Marty". 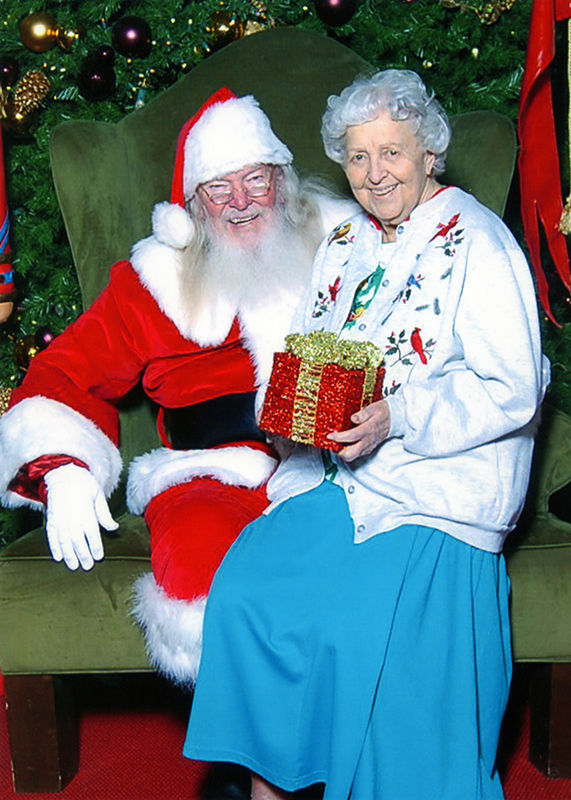 She was 92 years old. She will be missed but we will celebrate her life and not mourn her death. As my Mom said tonight "She is in the arms of Jesus today - where we are all trying to get". Rest in peace Jo, we will see you soon! I think Paul explained it best. . . 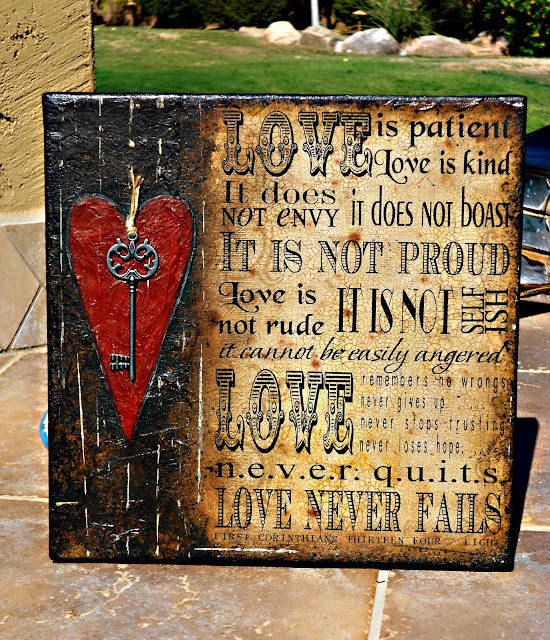 This is TRUE Love - I wish this for you all. Two Bugs and a Monkey! Last week my Daughter caught that nasty flu that is going around. Because she was soooo sick, she couldn't get Monkey to and from school so the girls came to stay with us. It was fun to have them all day. We did baths and homework, ate dinner as a family, watched cartoons and played. I see why 20 year olds have kids not people "my age"! The girls went home late Friday night and by Sunday afternoon Monkey was sick! By 10pm I was sick! By Monday morning Bug was sick! I am laying in bed watching old movies and decided to give a quick update since it's been a few days since I've been around. I hope the rest of you manage to keep healthy! Have a great week Friends - I will be back soon. . . .
Wanna Make a Little Easy Dough With Me??? Hey Friends, Just thought I'd share some "dough" with you all tonight. 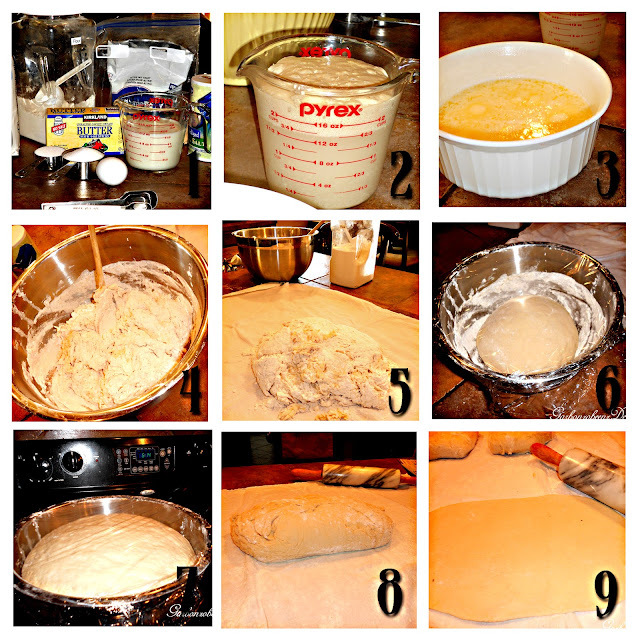 I have been wanting to make some homemade bread for a couple of days now but just haven't had the time. But today I had the time and so that's just what I did. This is a great recipe and it's just about foolproof (that's why I can make it so often) so I figured I would share the recipe with you all. I even had my camera handy and took some pictures for you of the different steps (don't we all like recipes better with pictures?). So let's get started. . .
2. Proof Yeast in 2 cups warm water & 1 Tbsp sugar. Let it sit until foamy (a few minutes) This is what it should look like when it is proofed. in a microwave safe bowl for 2 minutes. Let this cool for a couple of minutes then add 1 egg and salt to milk mixture. and stir in 1 cup of your flour. Now add your proofed yeast to this mixture. Add remaining flour 2 cups at a time stirring with a wooden spoon. and finish incorporating the flour by hand using a kneading motion. 6. Smooth out the dough and return to the bowl. and place in a warm spot to rise. This will take approx 2 hours. dump it out onto a floured cloth and separate into balls. spread your rectangle of dough with a mixture of softened butter, crushed garlic, garlic salt & Italian seasoning. 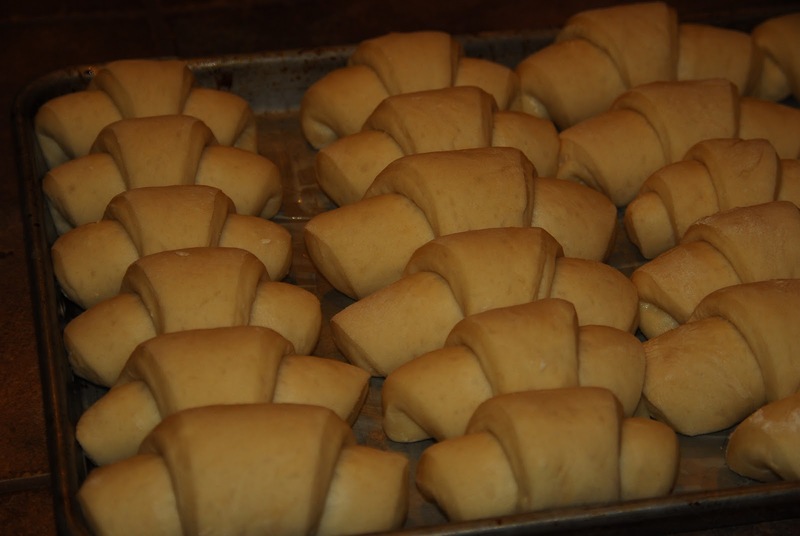 Then roll your dough up from the long edge so that you have a big long snake. Cut your snake with pizza wheel making about 1 1/2" cuts. spread the rectangle of dough with softened butter and then sprinkle cover dough with brown sugar with lots of cinnamon and a pinch of cloves mixed in (now is a great time to add raisins & nuts if you want). Then roll your dough up from the long edge so that you have a big long snake. Cut your snake with pizza wheel making about 1 1/2" cuts. Leave room for them to "grow" they are gonna rise again. 14. Eat them while they are hot! That is when they are the best! As you can see here mine were eaten before I could even snap the photo! 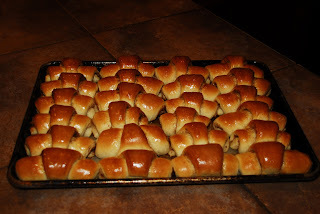 Oh My Goodness they were so yummy and my house smelled so good! 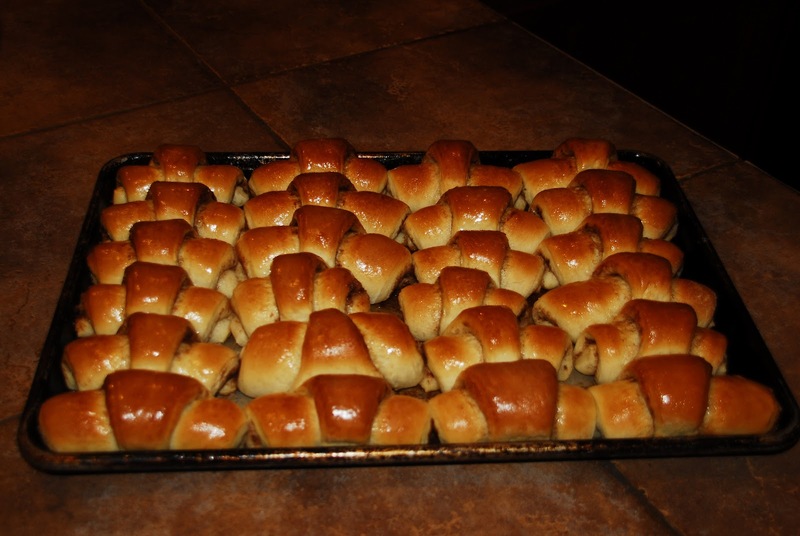 I promised the neighbors some of each so I ran them across the street while they were still hot and when I got back my family had already started eating them! I also made some for Bryanna's luncheon she is having tomorrow with a friend. So like I said before this dough is so versatile. I have made it into loaves and braids. I have made crescent type rolls with it and have filled it and frosted it with everything you can think of! Roll each ball out one at a time into a large circle. Spread softened butter onto circle (add cinn & sugar or garlic now if you like). Use a pizza wheel to cut the circle into quarters (pie shape) and each quarter into thirds. Roll each piece up starting with wide end. Tuck tip under and place on buttered cookie sheet. Repeat with remaining balls. You can even type little fortunes or notes and roll them up in the crescents. This is fun for a holiday dinner. At Thanksgiving you could write things you are thankful for etc. 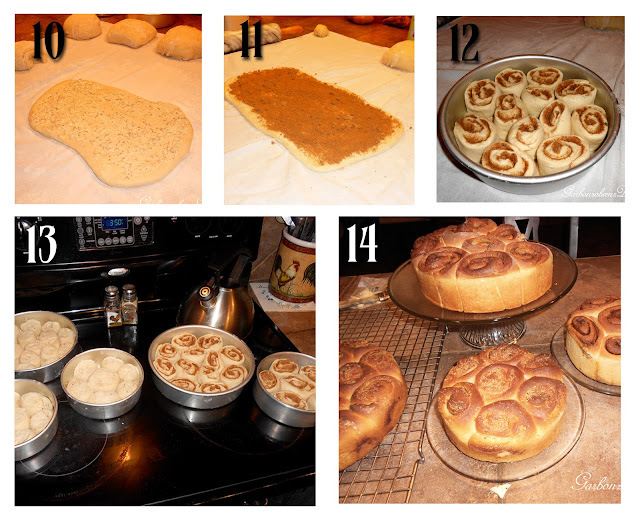 Anyhoo - I am gonna go have another cinnamon roll - I hope you will try this recipe, I know you will love it!